Charlotte, N.C., Oct. 25, 2011 – Crosland Southeast is leading the much-anticipated $6 million redevelopment of Quail Corners, a 113,000 square-foot, neighborhood retail center in south Charlotte. Site work will begin this week. CNL Crosland Commercial Real Estate’s retail property management and leasing team is in active negotiations with many restaurants and services to bring the shopping center to 100% occupancy. Salsaritas will remain in its current location through the end of the year, at which point they will relocate to an in-line location. 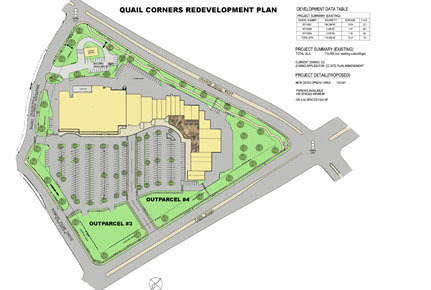 The Quail Corners redevelopment architect is BB+M Architecture and the general contractor is Myers & Chapman. This is Crosland Southeast’s second redevelopment to begin this week; the company began redevelopment today of Cloverleaf Mall to become Stonebridge in Richmond, Va.
Quail Corners, anchored by a Harris Teeter and Rite Aid, is a 113,000-square-foot unique neighborhood retail center providing shoppers with a diverse mix of specialty shops, restaurants and retail businesses. Located at the intersection of Park Road, Gleneagles Road and Sharon Road West in South Charlotte, it is easily accessible to residents in SouthPark, as well as neighborhoods bordered by Highway 51 and South Boulevard. CNL Crosland Commercial Real Estate offers a full range of commercial real estate services, including leasing and management, tenant representation, project management, facilities management and brokerage services as well as a development and investment platform. It operates in all sectors of commercial real estate, including retail, office, industrial and multifamily.